Not sure what a tabata is, follow this link (http://www.premierfa.com/pfa/2017/7/12/one-great-way-to-workout-with-your-kids) and you will find one great way to that I love getting parents to work out with their kids! It's summertime and your kid is now officially off from most responsibilities. They relax, play video games, watch YouTube, and overall just space out from the world. Periodically they clean a dish, take out the trash, or help around the yard. The issue is that they forgot that they struggled in their sport during the school year. They were out of breath, legs or back hurt, and they just weren't as good as they thought they would have been. As a parent, coach, and trainer, I know how important it is to help your kids with patterns that get them through life with energy, happiness, and health. Fitness is the glue that connects all of these. Here are some simple tips to follow which also helps YOU be healthier! PUT AWAY THE TECHNOLOGY and go for a walk with the family at least 4 times a week if not daily. Make sure that they spend time with their fall sport at least 3 times a week. And if it requires a partner, be that partner! Research simple exercises, download a timer app (search Tabata) and work for 16-24 minutes twice a week. If you don't know what a Tabata is, look at my "One GREAT Way To Workout With Your Kids" blog and get it done! MOST IMPORTANT ::: Make a plan every Sunday for the week and stick to it. Without a plan, it is just a thought and we know it will not happen. Let's get our kids in the best place to enjoy their individual or team sport in the fall (and any other season). They will be more confident, will perform better, and even will be less likely to be injured! The list goes on and on for the benefits so do some research, make a plan, and have a productive summer. As always, you have me here as a resource! A HUGE question that most don't even know that they should ask is: can you build muscle and endurance at the same time? Such a trick but it CAN be done. Hint: NUTRITION IS KEY!!! Read one of my favorite blogs that Runtastic put out. Click the button below! Does it impact weight loss? Does it increase/decrease performance? Does it change anything at all?! Click this link below to check out a great post from Runtastic!! As parents, we know it hard to keep up with our kids let alone get a workout in with them. That's why these 4-8 minute workouts are perfect! Tabata interval workouts are a special form of High Intensity Interval Training (HIIT) created by Japanese researcher Dr Izumi Tabata. Four minutes of high-intensity training is challenging but easy to coordinate. You can get to eight or 16 minutes by simply repeating the routine or adding additional exercises. Alternating between 20 seconds of maximum effort work followed by 10 seconds of rest for a total of eight rounds. These workouts are fast-paced, fun and can be made perfectly to allow parents to workout with their kids. Just remember: keep it simple, keep it to what everyone can do and keep working all the way through the 20 seconds! If you have any questions or need ideas, leave it on the comments below! Enjoy!! Health and Academic Benefits of Playing Youth Sports? If you are at my site then you understand the value of athletics for youth. If you have a hard time relaying the information properly to your kids, read this article with them. It's superb! Starts with health and moves to academics. As someone who loves to learn and loves fitness, these are crucial combinations to master! Playing sports provides many health benefits for kids beyond simply developing hand-eye coordination and burning calories. Although those are two important benefits of exercise, youth sports can also helps prevent a variety of diseases and conditions and set children on a path to a more healthy adulthood. Weight-bearing activity helps improve bone density, an important health matter, especially for females. While approximately 25 percent of men will fracture a bone during their seniors years, half of all women will, according to the National Osteoporosis Foundation. The Women's Sports Foundation recommends that teen girls participate in sports to help prevent osteoporosis later in life. Approximately one in three children is overweight or obese, according to the American Heart Association. The problem is twofold: poor diet and lack of exercise. Children who are overweight are more likely to be overweight as adults, increasing their risk for diseases and conditions such as diabetes, heart attack, poor cholesterol and high blood pressure. Regular aerobic exercise can raise high-density lipoproteins, or your body's "good" cholesterol. High blood pressure, also known as hypertension, can lead to heart disease, stroke and kidney failure. Weight loss can help reduce high blood, so sports that burn calories help address this problem. The more children participate in sports, the more they improve cardiovascular stamina and muscular endurance, or their activity to work over a period of time. The more endurance and stamina children have, the less likely they will fatigue during other activities, including play, walking to school or doing chores. Having more energy means your kid will be more alert and enthusiastic. Most children are naturally flexible. But, children who play sports stretch their muscles on a regular basis during practice and games. If their coach includes pre-game warmups and post-activity static stretching, this will further improve the child's flexibility. Being flexible means your kid will be more agile. This ability to move and bend will serve her well during game play. PremierFA - Pride Shirts !i!i! PremierFA is proud to stand behind our LGBT community with commemorative shirts to show that we stand with those that struggle with any form of inequality. Please visit this form to get one for yourself! Hello PremierFA family! Together we face a world that is engulfed in hate, war and discord. As we touch base with our consultants on media imaging, it is brought to our attention that it would be good to keep personal views away from company views. We are not ones to hide our true vision for your kids and we would not do so for the parents either. Without the support of our gay friends, family members, and coaches, PremierFA would not be the proud company that it is today. Celebrate your differences. Don't let the world define you. Wear the style you want. Have your hair how you want. And remember to hold your head up high knowing that PremierFA is behind you with pride, power, and love. 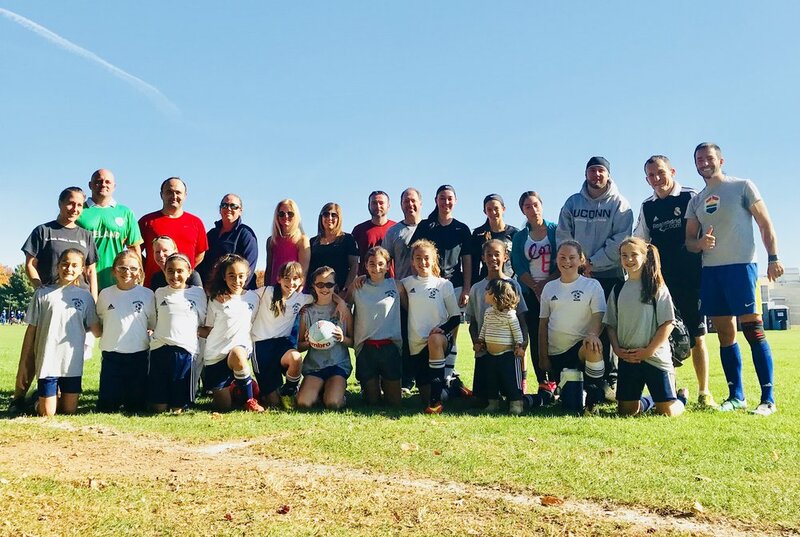 In early March of 2017, PremierFA had the pleasure to coordinate with Rocky Hill Soccer Club for a large scale training program that would consist of multiple facets of training for over 2 months. In that time frame Rocky Hill soccer players were pushed through agility, strength, speed, endurance and many other types of training. The sessions were always different but one thing was always guaranteed: intensity. If you weren't there to watch your child perform, simply speak these words during dinner and see their response: "If you don't do the dishes after dinner, you get Diego Time." The athletes were special. Some were new to the sport and had never worked with a coach before let alone a performance trainer. Others were strong athletes playing at some of the highest levels of soccer in the northeast. Every one of them was a pleasure to see week after week and, more importantly, to see them grow in form, work ethic and intensity. Not one walked away without learning. And not one walked away without a special place in the history of PremierFA. Thank you to RHSC for the opportunity. Thank you to the parents for bringing the athletes every week and having them prepared. Thank you for the positive feedback and recognition. A special thanks to my wife for supporting me. And most importantly, thank you to each and every athlete that showed up every week, worked through some of the hardest workouts they have ever experienced and grew so much. It has been a pleasure and I look forward to being involved in the growth of Rocky Hill soccer for decades to come. Rocky Hill Soccer Club selects PremierFA in an alliance that will drive RHSC athletes to new levels of performance for all ages. Beginning in spring, we will have weekly sessions connecting the athletes with custom professional programs developing strength, endurance, agility and more. Stay tuned! PremierFA hats on order today, January 24th! PremierFA has an order ready to head out to our branding company. These hats are open to anyone that is looking for a flex fit hat that fits comfortably and reps your favorite training brand!! Ordering TODAY so connect with me if you are interested! PFA gym bags are here! I am super hyped to announce new custom 20" duffle/gym bags from PFA ! If you are in the need of a new bag, comment on this post or contact me directly. I will reach out to you. Even with the embroidery I am able to offer these at $30 including shipping so reach out soon as orders will be placed on or around December 16th. After weeks and months of training, sometimes you remember your goal but don't remember why it is your goal. Your friends, coaches and parents will all be proud of you when you reach your goal but only one person knows the depth of why you are doing this. For this reason, always remember that you aren't doing this for the fame. You aren't doing it for the recognition. At the end of the day, your hard work is for you. So keep plugging along. Keep waking up. Keep following your guide: your heart and soul. Because, at the end of the day, the glory will be all yours. The HMTCA Varsity boys soccer team has had their most memorable season yet. It has been a pleasure to meet with them multiple times this season to develop teamwork, skills and movement on the pitch. Year after year this team improves and I am looking forward to a strong finish! After a very busy summer and fall, PFA is opening up training opportunities to local soccer and other athletic facilities. Opportunities are incredibly limited so please reach out to open the channels of communication.